Out of the blue....new and exciting things! New things are always exciting, right? Well, not all things. I’ve been battling an itchy spreading rash for the last four months. No worries, it's not contagious!! After several rounds of high dose steroids...which made me hungry and more cranky, than usual! The doctor had me go “fragrance free” for a month, that was super fun! Talk about lame-o! No good smelling soaps, hair products or perfumes. You know the drill. So, I endured being hungry, cranky and smelly for several months to finally be patch tested. Again, super fun! Now, for the exciting news! Drum roll please! I’m allergic to the dye dispersed blue number 106, which is evidently in EVERYTHING! Lol, on the upside, I can still look at blue and even eat it (not that I eat much blue). I simply can’t wear any dark colors, at all- black, blue, purple, green, turquoise and so on are out, at least for awhile! No shades of blue at all, and anything this blue dye could be in. Oh, I can wear men's Levi's 501 jeans...now, there is a sporty look for me! I absolutely love and wear blue- all the time! SO, my new color is taupe, tan, beige, white and shall I say…off white. I can where red, orange and yellows! I can wear some pink, if it is cool pink…not sure what cool pink is?!? Pastels too, I think! We will see! Yes, fall and winter is coming and I'll be in winter white and taupe! Oh, and possibly hot pink. John says I look like Pepto-Bismol. Out of the blue, no pun intended…I’m allergic to blue. Go figure! It's new. It's lame. It's really not that big of a deal, it's just a pain. 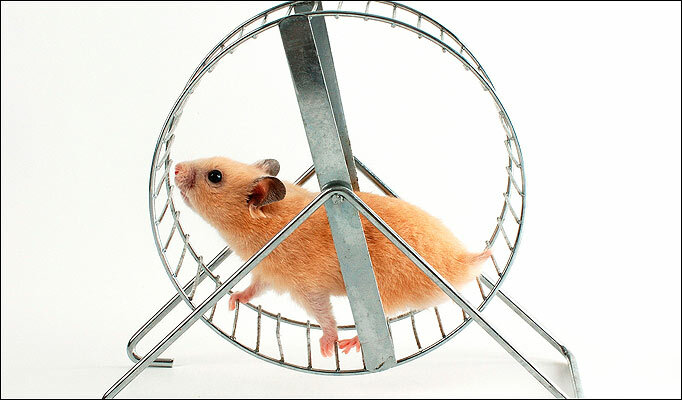 Do you ever feel like you are on the hamster wheel? Me too! Fall is here. The school year is in full swing...fall ministry is starting up and life will soon feel like the hamster wheel. Exhausting. Uggg. I was able to get off the wheel this summer. It was great! But life has responsibilities and duties. Life has a calling as a disciple of Jesus Christ. Life is not passive it is active. My question is: how do we stay off the hamster wheel of busyness and get actually moving forward following Christ? 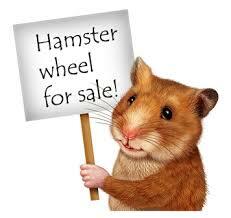 It is time to sell the hamster wheel! But how? No, seriously...how? It is time to sell the hamster wheel mentality. Busyness does not equal godliness.But, it's also not about taking a full-time nap! It's about fruitful running, not duty-filled-exhausting-pointless running. I think part of the answer is found in learning how to "abide". In John 15:1-5, Jesus tells us, “I am the true vine, and My Father is the vinedresser. Every branch in Me that does not bear fruit, He takes away; and every branch that bears fruit, He prunes it so that it may bear more fruit. You are already clean because of the word which I have spoken to you. Abide in Me, and I in you. As the branch cannot bear fruit of itself unless it abides in the vine, so neither can you unless you abide in Me. I am the vine, you are the branches; he who abides in Me and I in him, he bears much fruit, for apart from Me you can do nothing". I don't want my hamster wheel running to count for nothing! I want the fruit of exercise to last and go somewhere. Abiding, resting, trusting and leaning into the Vine is how we learn to follow Christ and move forward. I need the reminder to sell the hamster wheel and take up abiding...it starts with recognizing the wheel. Sell the wheel! Trade up for abiding.